Patients undergoing surgery will be prepared for the experience in the best possible way as a new website and app are launched to support the Enhanced Recovery After Surgery plus (ERAS+) programme. There are around 250,000 high-risk elective major surgeries a year in England and Wales and there is a post-operative pulmonary complication risk (PPC) of up to 30%. Complications, such respiratory failure or pneumonia, can increase the length of stay in hospital and reduce life expectancy after surgery. The ERAS+ programme places the patient at the centre of their own recovery and supports them to be dynamic in their own care. The includes six weeks of pre-surgery patient preparation and post-hospital recovery six weeks after, with patients and their family supported through a Surgery School. It encourages increased activity, better nutrition, oral healthcare and the practice of chest exercises to help reduce chest problems. It aims to reduce complications post-surgery, reduce the length of stay in hospital by around three days and improve quality of life for patients for six to 12 months after major surgery. The training programme, developed in Greater Manchester and championed by Dr John Moore, Consultant in Anaesthesia and Intensive Care Medicine, is one of seven projects which has recently received a £500,000 award from the Health Foundation. ERAS+ has been recognised as a proven health care intervention and this prestigious award will be used over the next two-and-a-half years to deliver and extend the benefits of ERAS+ across the UK. ERAS+ teams will work together with a range of organisations to promote and embed changes across the NHS to improve patient outcomes following major surgery. As part of this endeavour, a mobile phone application and website has been developed to support the implementation of ERAS+. 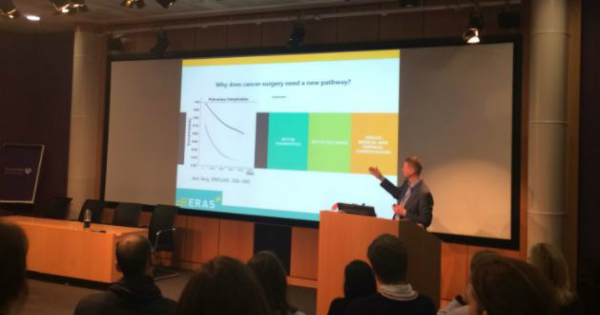 The website, launched on 12 April, provides supportive material aimed at patients and healthcare professionals for the ERAS+ application as well as comprehensive information on what ERAS+ is and its benefits for major surgical patients. The website also provides access to local council fitness and well-being facilities available to members of the public ensuring training for major surgery can be undertaken no matter where patients are based. iSAT Health and Desap System Solutions were commissioned to design and build the ERAS+ Mobile Application, following their previous work with Salford Royal NHS Foundation Trust. The application has been designed to prescribe specific activity and daily training regimes in the weeks leading up to major surgery for patients of varying levels of fitness. It can also deliver daily notifications and reminders as well as regular progress monitoring reports to provide an interactive platform for all patients to improve their fitness before surgery. Roger Kadama, CEO, iSAT Health & Desap System Solutions said: “The use of our ISDT Platform to build the ERAS+ Mobile App is very important component of delivering an effective Mobile Solution for ERAS+”. The ERAS+ application can be downloaded for free from Google play and App store onto a mobile phone or tablet.